After The Pilot started off Doctor Who’s current run by shaking off the complex plots and blockbuster stylings of the Steven Moffat era in favour of something more akin to Russell T Davies’ work, Series 10 is continuing that noughties Who feel by taking new companion Bill first to the future, then to the past. This week, we had the trip forward in time, in the form of Smile, by Frank Cottrell-Boyce, a writer who’s only contributed to Who once before, with 2014’s frankly dreadful In the Forest of the Night. Well, Doctor Who’s all about second chances, right? 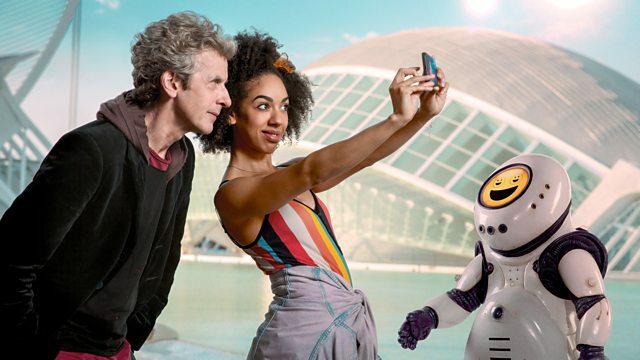 Smile sees the Doctor take Bill to one of humanity’s first colonies, a gleaming utopia (or so it seems) far out in space. 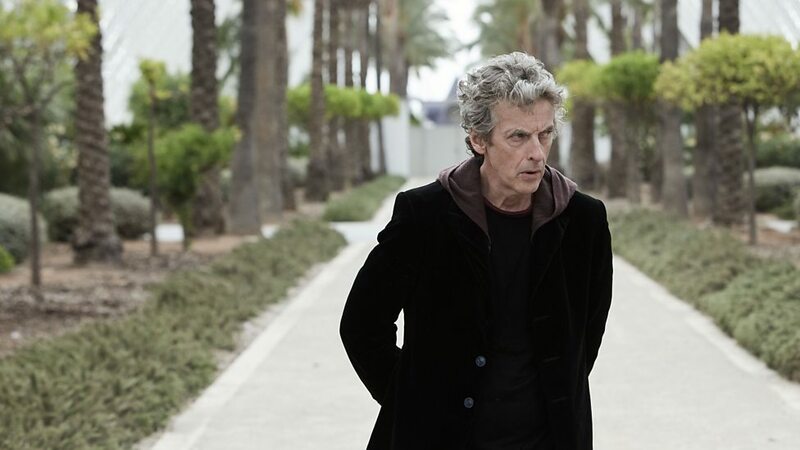 Putting aside any questions about the future timeline of humanity in the Whoniverse (I gave up on trying to make sense of that long ago), the first thing Bill, and indeed the audience, notices is just how gorgeous this place is; the crew’s trip to Valencia to film this was certainly worth the money. Then they notice the Emojibots, cute little things with a habit of turning nasty. Turns out the robots who built the city have misinterpreted their programming, and anyone not happy enough gets offed. As Bill and the Doctor explore this colony, the first half hour is... not slow exactly, but relaxed. This actually works to Smile’s advantage – it’s good to spend some time with this new team and get used to their dynamic, while the delight with which Capaldi and Mackie approach their roles is infectious. Bill’s inquisitiveness is helping her stand out as good companion material, though she doesn’t actually do much to move the plot forward. And plus points for the Doctor quoting Bowie. The story is reminiscent of Seventh Doctor serial The Happiness Patrol, which used a world where happiness is illegal to spin a Thatcherism satire. There’s no such satire here, with Cottrell-Boyce’s tone being, like In the Forest of the Night, more akin to a sci-fi fairytale, which allows for the very Moffat-y gimmick of having to force a smile to trick the Emojibots and for the overly happy ending. This fairytale tone carries over into some of the production design, sometimes a little too much; that room with the corpse on display, and a book of Earth's history next to it for whatever reason, feels oddly twee and out of place. The robots themselves are fun, probably particularly so for the kids this series needs to win over, but I can’t help but feel it would be much creepier if the Emojibots themselves could kill people rather than being merely henchmen of a different kind of robot – a messy construction which takes away from the irony of such a cute robot actually being a threat. Similarly, there are several parts of the episode’s plot that just feel sloppy, most notably the process of the Doctor’s investigation. It’s not clear how he works out that you can get past the Emojibots by pretending to smile. Nor is it clear why he jumps straight to the last resort of blowing the whole city up rather than investigating what’s turning the Vardies bad – particularly weird as he’d just been waxing lyrical about why Bill shouldn’t offend these robots. And then, near the end of the episode, he has not one, but two scenes that are presented as big moments of revelation – complete with climactic score and “of course” monologuing – where he doesn’t actually learn much that’s new. “Grief... as a plague!” Erm... I thought we’d all already worked that out. The last one is particularly messy: why does the Vardies reacting to threat mean they’re alive, didn’t we already know they’re alive, and why does realising they’re alive give the Doctor the idea to turn them off and on again? And why hadn’t he had that idea earlier, especially given he’d been going on for most of the episode about a parable which ends with the main character pressing a reset button? Nothing seems to connect, and that seriously hampers the drama of the episode. Nevertheless, Smile isn’t bad. It’s a gorgeous-looking episode with some fun robots, which helps build up the partnership of the Doctor and Bill, as is important at this stage in the series. And it’s a big step up from Cottrell-Boyce’s first attempt. But, with a bit of logical thought, it could have been much better. To be honest, I’ve been looking forward much more to Sarah Dollard’s historical episode; with part two of Bill’s three-part tour of basic Doctor Who settings done, that’s up next. And I did love that teaser at the end, with the elephant. I enjoy the little links between episodes. The development of the series arc at the beginning of Smile was fun, too, with Nardole showing up to remind us about this oath thing. Anyone got any good theories as to what the Doctor’s protecting? Doctor Who Adventures 23 - Out Now!